DOH-CALABARZON (Cavite, Laguna, Batangas, Rizal, Quezon) together with the Philippine Society of Hypertension (PSH) and MIMS Philippines and local health executives of the region agreed to implement a Package of Essential Non-communicable (PEN) Disease Interventions also known as Phil PEN to reduce the rates of lifestyle-related non-communicable diseases (NCDs) in the province through early screening and consultations including timely treatment at the local level during the PhilPEN Summit held in Tagaytay City on January 11, 2019. 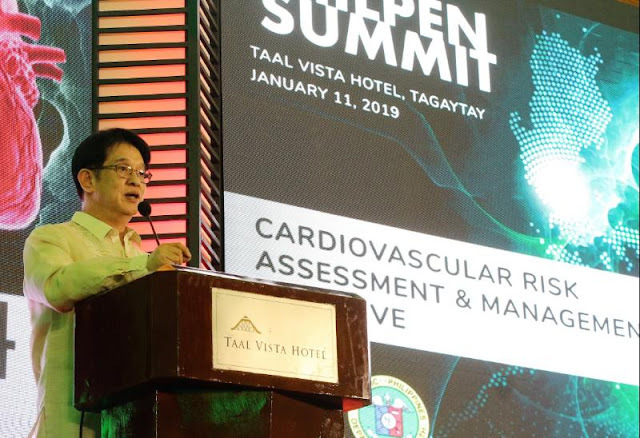 “We need to start implementing interventions in order for the people to be protected from these cardiovascular diseases (CVDs) like hypertension and stroke at kailangang umpisahan sa mga parents to the newborn hanggang sa pagtanda ng pasyente dapat alagaan natin sila at maiaasyos ang kanilang mga sitwasyon upang hindi sila magkaroon ng mga hypertensive episodes ang kahit sino at mapalaki silang malusog at mapahaba pa ang kanilang mga buhay,” Regional Eduardo C. Janairo stated during his message. “Even though CVDs are hereditary, it can be prevented pero dahil nga sa mga factors that aggravate these diseases such as unhealthy lifestyle such as excessive salty food intake, lack of exercise and even stressful environment lumalabas ito kaya dapat tayong umiwas upang hindi ito lumabas sa atin at makaiwas tau sa ganitong sakit,” he emphasized. DOH listed cardiovascular diseases (CVD), cancers chronic respiratory diseases and diabetes (DM) among the leading causes of mortality in the country. These are known as Lifestyle Related Non-Communicable Diseases (NCDs), particularly because they have common risk factors which are to large extent related to unhealthy lifestyle. According to World Health Organization National Communicable Disease Progress Monitor of 2017, heart disease is the leading cause of death in the country with claimed 74,134 lives in 2016. DOH Field Health Service Information System recorded a total of 601,173 cases in 2015. The Philippines also has the highest probability of dying from NCDs between the ages of 30 and 70 years old. Janairo also disclosed that recent study on hypertension showed that Filipinos have CVDs as early as 15 years old. “Prevention of non-communicable diseases starts at the time when a baby is born, kaya dapat ung pagpapakain natin sa ating mga anak hanggang sa kanilang paglaki dapat nating mabantayan at mabigyan sila ng mga pagkaing masustanya gaya ng mga prutas at gulay hindi yung ibibigay natin ung gusto nilang kainin tulad ng spaghetti, fries at burger. Bilang mga magulang dapat sanayin natin at gabayan ang ating mga anak sa kanilang choices ng pagkain upang lumaki silang malusog at malayo sa anumang sakit,” Janairo encouraged. Janairo also pointed out that one of the measures to address the growing concern of NCDs in the region is to implement an ordinance together with the support of the local government units in the region to encourage food establishments to disclose the caloric contents of every food in their menu in order for consumers to make a healthier choice on what to eat. “This will also promote health awareness and will provide great help for those who are monitoring their diet or those who have CVDs and even diabetes. We will pilot this program in Cavite because this is the province with the highest prevalence of NCDs in the region pending the approval of proposed Nutritional Information Disclosure Bill. The Philippine Package of Essential Non-Communicable Diseases Interventions (PhilPEN) was adopted and implemented in 2012 in low resource setting from the World Health Organization and was included in Philhealth’s Primary Care Benefit Package in 2013.